Note: This program contains racial stereotyping themes that may be offensive to some listeners. Here's the last disc I have in the syndicated Christmas series, "Uncle Remus". 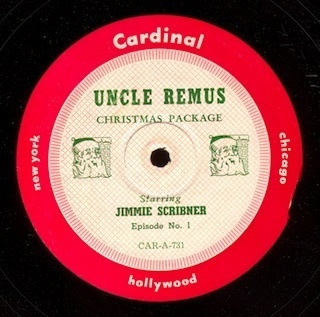 Jimmie Scribner tells Remus stories to a group of children getting ready for the holidays in this series designed to run a few weeks leading up to Christmas. Program 11 of the series is a story about Brer Fox plotting to capture Brer Rabbit with a singing bird. The show was digitized from an original Cardinal vinyl transcription, matrix number CAR-A-741. Here's another holiday-themed show from the collection. 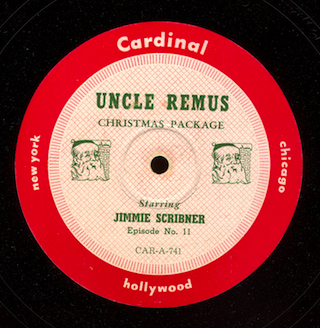 In this post, program 1 of the series "Uncle Remus" featuring Jimmie Scribner. This syndicated holiday show was originally heard in late 1947 and has Scribner, a comedian who was known for Black-dialect comedy, telling Remus stories to a group of children getting ready for Christmas. The show was intended to run as a feature in the weeks leading up to the holiday. The show is rather obscure today - it appears to have been withdrawn from syndication after its first run on the air. Scribner re-recorded the series as "Sleepy Joe" a bit later. You can read some background on Scribner and the series in an earlier post on the blog. This previously lost episode of the series was digitized direct from an original Cardinal vinyl transcription, matrix number CAR-A-731. I've got one other episode in the series I'll post next week; you can hear program 2 and what I think is program 4 (based on the matrix numbers) that I posted on the blog a few months ago. Continuing with our look at "Uncle Remus", here's program 2 in the series, "The Tar Baby". As we mentioned in the last post, this series was syndicated in late 1947 for the holidays and featured Jimmy Scribner, a Black-dialect actor and comedian, who played all the roles in the show (except the children, of course). The story of Brer Rabbit and the Tar Baby is probably the most well-known of the Uncle Remus folk tales, forming one of the major animated sequences in Disney's film adaptation of the stores, "Song of the South" released during the same time period as this radio series. The show was transferred from an original Cardinal vinyl transcription, matrix number CAR-A-732. Today, we begin a series of posts devoted to holiday-themed old time radio programs that will go on the blog/podcast through the month of December. First up, two very rare shows from the series "Uncle Remus". The series was syndicated by Cardinal beginning with the 1947 Christmas season and was designed to be run five days a week through the holidays. The program features Jimmy Scribner, a well known actor who created, scripted and acted all the parts in the Black-dialect soap opera, "The Johnson Family". (You can hear a sample episode of "The Johnson Family" here.) Scribner even tried a trial run of the show on a Los Angeles television station in the 1940s. In "Uncle Remus", Scribner tackles the classic African-American Uncle Remus folk tales, playing all the roles in the show. Some programs in the series have a story with a holiday theme and others don't, but all featured a framing device of children getting ready for Christmas and hearing Uncle Remus tell stories. Documentation on the show is a bit slim - R.R. King on the otr mailing list dug up several newspaper ads from around the country when the show was first run. After the initial run, it appears that the show's titled was changed to "Sleepy Joe" and these later programs show up at sites like archive.org, sometimes under the "Uncle Remus" name. The re-recording of the show and name change may have occurred because of Disney's "South of the South", which was playing in theaters in 1946-47, or due to other local or regional radio shows featuring the Remus stories, but that's simply conjecture on my part. Scribner did a television version of "Sleepy Joe" around 1950. "Mud Pies" was transferred from an acetate dub of one of the original transcription discs. The origins of this dub are obscure - perhaps it was created as a replacement for a disc that was lost or damaged by one of the stations that purchased the "Uncle Remus" package.